Restoration of the late 1920s “Remington Rand Powers” sorting machine, an old treasure of the Assitalia company’s mechanographic centre, was completed recently. Until 2003 this machine was exhibited in the Rome offices of INA, on Via Sallustiana. Following the sale of the building, it was moved to the company’s warehouse, and since 2016 has been on display in the reading room of the INA Assitalia Historical Archive. The Remington Rand Powers (L: 1.70m, H: 1.10m, D: 0.45m), was situated in the data processing administration office (SIA-SED) and was used for many years. 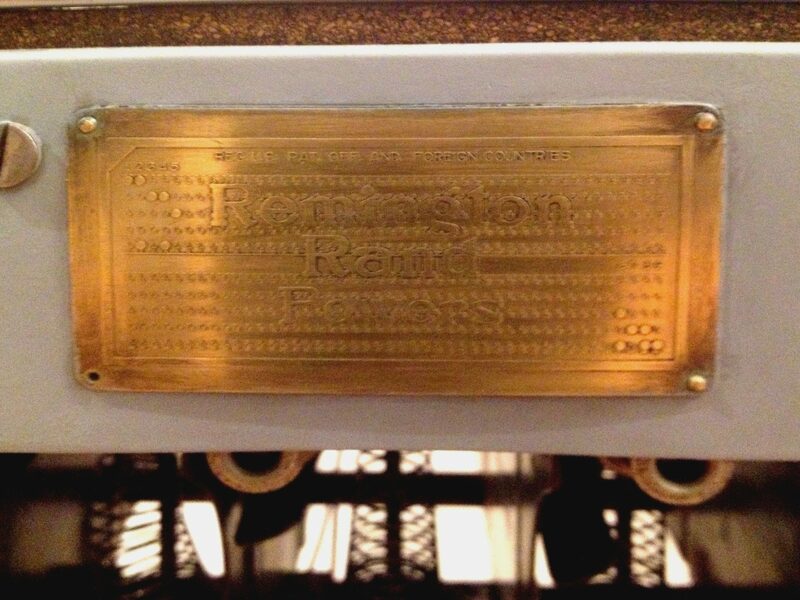 When INA began the work of reorganising its Historical Archive in the 1980s, the general director, interested in recovering any significant memento of the past, wrote to the general director of Assitalia requesting the Remington Rand Powers machine for the mechanised records selection. The Remington Rand Powers used mechanographic technology similar to that of Hollerith machines, with automatic calculations performed on both numeric and alphabetic data held on punched cards. The patent for the first machine was granted to Herman Hollerith in 1890, at the time of the census of the US population. The Tabulating Machine Company, subsequently International Business Machines Corporation (IBM from 1924), was created in the same year. James Powers, the manufacturer of our sorting machine, was a direct competitor to Hollerith. It was Powers who became the principal supplier of tabulating machines to the US Census Bureau at the beginning of the twentieth century. In fact, at the time, Powers machines were faster, more reliable and, above all, cheaper than Hollerith machines, and used mechanical sensors to detect the punched holes, whereas Hollerith machines used electrical sensors. The Powers Tabulating Machine Company was founded in 1911. Its name, however, does not seem to have found as firm a place in history as that of Hollerith: in the late twenties, in fact, the company was acquired by the colossus formed by the union of Remington and Rand Kardex (one a typewriter manufacturer, the other a producer of data storage cards) that gave birth to Remington Rand Powers. In their first years of business the two engineers used litigation to protect their patents, which related to differences in card types, the shape of the perforations and the operations that could be performed. Only IBM, however, was able to cope with the great crisis of 1929, and in the following years it established itself as the leading manufacturer of office machines all over the world. It was not long before the punched-card calculating machines arrived in Italy. The first to use them was ISTAT (Istituto nazionale di statistica, the Italian national institute of statistics) in 1894. Pirelli and INA followed in 1914; FIAT and Banco di Napoli in 1919, and the Ferrovie dello Stato (state railways) in 1927. In 1931 they were used to process Italian census data. In the thirties they also came to Assicurazioni Generali, where Bruno de Finetti, the greatest Italian scholar of applied mathematics of the twentieth century, developed the company’s first electrical accounting facility, using these machines with great success and thus marking the beginning of a new era in the organisation of accounting work in the insurance sector (for further information on Bruno de Finetti see: M. MARIZZA, Bruno de Finetti and Assicurazioni Generali. Lots of Light and a Little Darnkness, on a Long-Lasting Cooperation, in Generali in History. Tales from the Archive. Twentieth Century, Venice, Marsilio, 2017, pp. 170-175, and A. MILLO, Bruno de Finetti, ibid., pp. 176-181).